`Drips from the Sun` is transparent resin gel which cures when exposed to ultraviolet rays. The resin has been improved in quality with high transparency and stronger adhesiveness. Unlike 2-part epoxy resins it's `ready for use`, no mixing required. Use just the amount you need without waste resin and time. It gives a very clean, transparent look and has outstanding hardness properties. 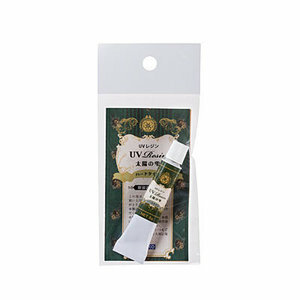 Cured time 2 - 10 minutes with UV light (36w), 10 - 30 minutes with sun rays on fine weather, 30 - 60 minutes with sun rays on cloudy weather. No Fire. Use resin in a well-ventilated room. Use gloves, glasses, and apron to protect the direct contact with skin, eyes and clothing. Do NOT left UV resin for a long time under the fluorescent light to avoid curing in air. Proper storage temperature: 0?- 25?.